It’s a good morning in San Antonio. The view out my window speaks of fall. The sky is grey and it looks like a very cold, wet morning. The Bradford Pear has turned a rich burgandy color with touches of orange. Leaves litter the ground below the tree. 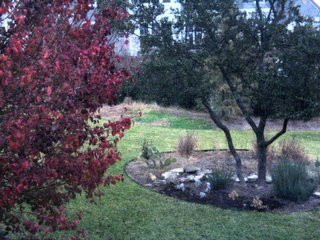 The geraniums were frozen last week and their light brown color is in contrast to the dark brown mulch of the flower bed. Although some days I would prefer the bold colors of a tropical view out my window, the passing of the seasons can be very comforting.